A 5 month old kiwi from the Kiwi Creche in Atarau. 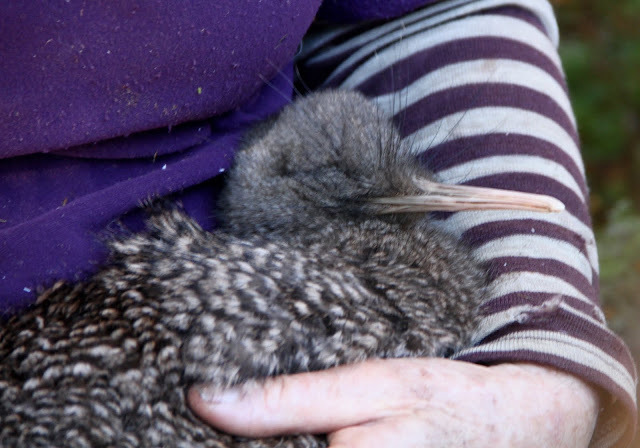 This is managed by the Paparoa Wildlife Trust who do an amazing job looking after, tracking and keeping these beautiful birds from becoming extinct. Please visit their website for more information about what they are all about. Hi Room 2, It's so great how you got to meet a real Kiwi. We don't have many of those around Auckland. Do you know how many Kiwis there are in New Zealand? From Room 1 at Pt England School. Hello there Room 2, It's so amazing how you got to see a real live Kiwi. We really don't have many of those around Auckland really. Do you know how many Kiwi's there are in Auckland?